LOTTER, T.C. - America Meridionalis. America Meridionalis. - LOTTER, T.C. Date : Augsburg, c. 1760. Size : 17.8 x 23.1 inches. / 45.2 x 58.8 cm. Description :This is the more scarce edition with the title cartouche lower left surrounded by Neptune and a native Indian. 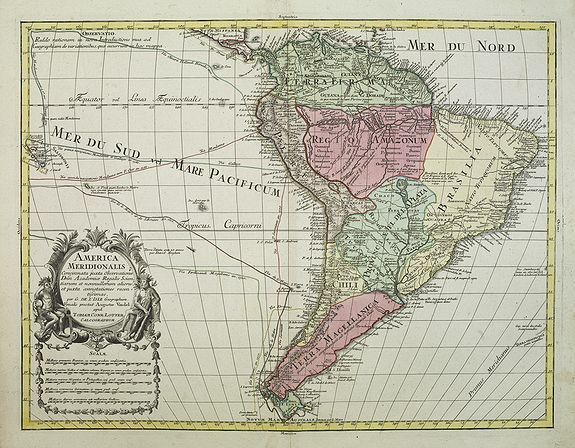 A rather accurate depiction and descriptions of South America. Brazil is slightly enlarged and bears mainly names of the costal zone. The inland was rather unknown at the time and regarded as both pagan and dangerous area like the Amazon. Argentina with Cape Horn and the Falkland Islands are merely deformed. The map was published by Matthäus Seutter's son in law Tobias Conrad Lotter, who continued the work and renamed many of Seutter's map with his own. Condition : With an uncoloured title cartouche.